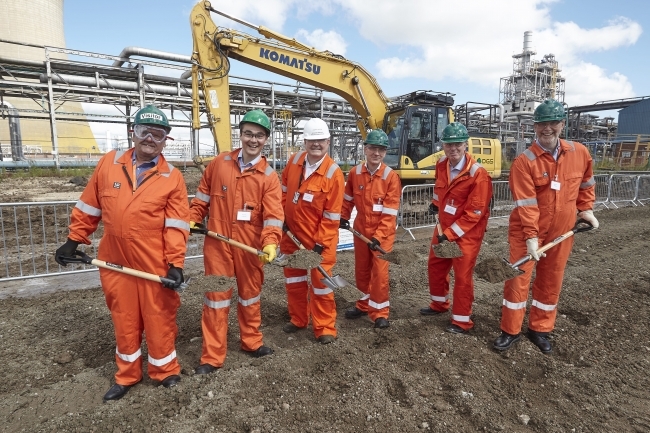 Tricoya Technologies have broken ground for the first phase of construction at the site of the world’s first Tricoya wood chip acetylation plant at Saltend Chemicals Plant, Hull. The new plant is being funded, built and operated by a consortium of companies formed in March 2017 including Accsys Technologies, BP Ventures, BP Chemicals, Medite, Business Growth Fund (BGF) and Volantis. The plant has also received funding from the Green Port Growth Programme and from the LIFE programme of the EU. Tricoya acetylated wood elements (including chips, fibres and particles) are a revolution in modified wood fibre technology. Tricoya is widely recognised as the gold standard for manufacturing high performance wood-composite panels that can be used in wet environments, both internally and externally. Tricoya panels combine the stability and durability of non-wood materials with all the advantages of wood-composite panels: sustainability, versatility, light weight and ease of use, installation, coating and forming. Tricoya panels are the biggest innovation in the wood industry for 30 years and are guaranteed for 50 years above ground, 25 years below ground. Tricoya is non-toxic providing no restrictions in end of life or reuse of panels. All wood used in the Tricoya production process is sourced from sustainable resources such as certified, reclaimed or recycled timber. Tricoya is EUTR compliant and is produced from fast-growing, well managed, legal sources. With superior durability and stability Tricoya has a considerably longer lifespan than unmodified wood products which leads to lower maintenance frequency.